But then I had to figure out what they were. And field guides to Australian mammals were not as much help as you’d think. The critters hadn’t always aligned themselves for a nice profile pic, I couldn’t see beneath their feet to count their toepads, and really, how long is a long nose supposed to be? Since then, I dunno how many hundreds of thousands of images I’ve processed. My last record was something like 179,000 in 10 days. 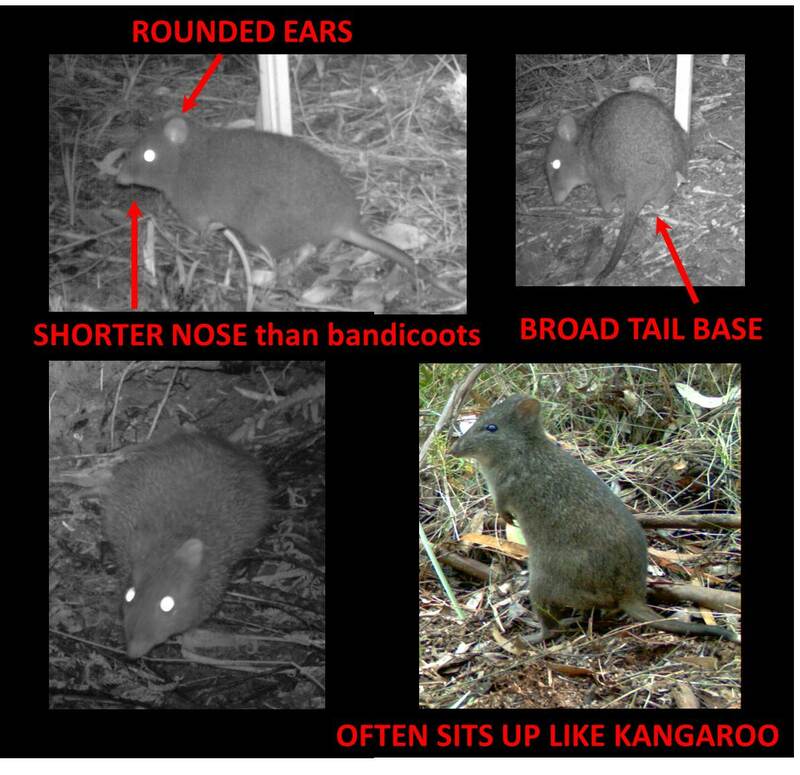 My eyesight might never be the same again, but I’m pretty confident now on a dusky antechinus versus an agile, a long-nosed bandicoot versus a ditto potoroo. One of my most useful tools though, is my reference library of images. I refer to it whenever I have one of those is-this-a-bush-rat-with-shortish-tail-or-a-swamp-rat-with-a-longish-tail? quandaries. So I thought it might be helpful to some other people too. Have a look if you’d like – I’ve included it as a new page in this blog. Let me know what you think and feel free to send me images of other species if you reckon it’s worth adding too. * although I just learnt one of those involving a bloke who became an ex-tractor fan. Boom boom – thanks Dave! Great talk last Friday (biodiversity across borders conference)! Really interesting to hear about the different movement patterns of foxes and lots of food for thought when it comes to baiting or control programs. 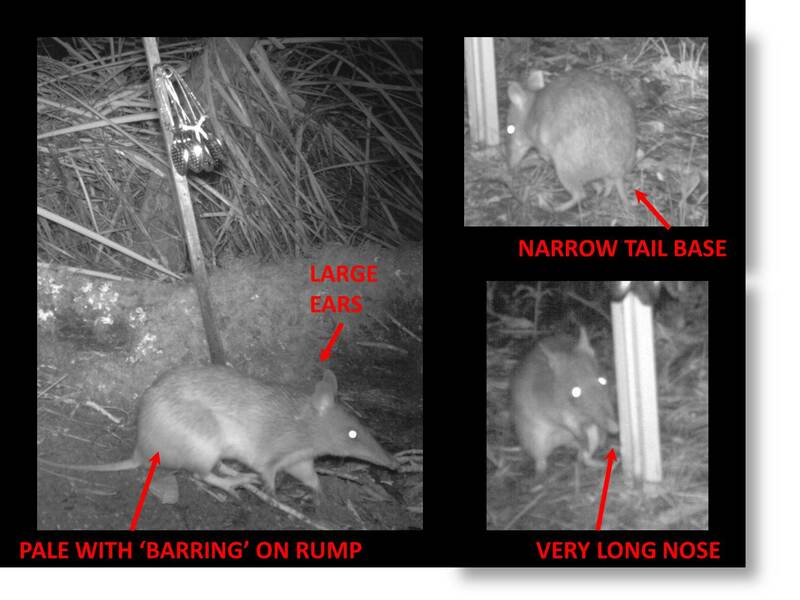 Thanks for producing this reference library – it appears that maybe we need a new field guide for Australian mammals on camera traps. Hi Bron, great blog and useful library. We are hoping to set up some camera traps in our landscape and your library looks like it will be a useful reference. I remember Peter Menkhorst reinforcing that the direction you place your cameras is really important depending on your target species. Also great talk you did on Friday. Your foxes are almost endearing. Shame they have a taste for the locals. HI Natasha, thanks for commenting 🙂 I’ve always put cameras horizontally (facing out) but Justine Smith also found that vertical (looking down) can be very effective for some species http://www.publish.csiro.au/paper/AM11034.htm I think the most important thing is making sure that your detection zones are lined up with the lure and that your lure is an appropriate distance from the camera, depending on your study species. For small animals, setting up cameras close to the bait station (maybe 1.5m) and lining up the detection zones so that they cover the ground between the camera and the lure seems pretty effective. Predators can be a bit warier so a setting up your camera further (2-3m) from the bait station and aimed slightly higher can help detect them if they approach but don’t come all the way to the lure. If you have any tips on picking out Common Brushtail Possums from Bobuks (Mountain Brushtail) we would love to see them. Overall a great initiative and I am sure that it will be a great reference to people including our group. Thank you. Thanks for the suggestion Tarra Bulga – they’re definitely a good species to include. I’ve never had bobucks in my survey areas but I’ve just been talking to a friend who is working in the Central Highlands and she’s going to send me some photos so I’ll add them asap. Which other species have you be getting in your surveys? Of the small Mammals as well as the Possums (including Ring-tails) we get Antechinus (probably mainly Agile but Dusky are also possible, Long-nosed Bandicoots and Rats which are probably mainly fuscipes (most of them seem to have the Roman nose). See http://wp.me/p20oDd-khJ for the latest post with a summary of our results. So far we have not been separating the the Antechinus, Rats or Brushtails into separate species but your guide has inspired me to see if we can achieve this. I’ve just added bobucks, common brushtails and ringtails to the library (many thanks Kate Parkins for the bobuck photos and ID tips!). Sounds like you’ve got a great survey program going in Tarra Bulga. That photo of a cat with prey is impressive (though depressing) – what do you think it’s holding? A glider? Thanks for that, I am pretty sure it is a Sugar Glider (the Cat is holding). I have been collecting my clearest Brushtail photos for a while now and I will have a close look for any tell tale evidence either way for each species. Have gone back over some past photos now and think I was struggling to see any difference in the Possums because they all seem to be Bobucks (at most of the sites). I have my eye in now and can see the Common’s have almost alien like ears in comparison and the dark patches on their snouts are also evident. One or our sites from 2012 (at a lower altitude to most of the others) clearly has both species visiting so it will be a new task now to go back through the photos and id each one. The results should be interesting. How do I send you some camera trap photos please Bron? The easiest way is probably to email me at hradskyb ‘at’ unimelb.edu.au. If you could send me some photos showing mountain vs common brushtail feet, that would be awesome – thanks!